A quickly put together music video of the frontline at Mt. Elphinstone. Music by Rick Buckman Coe and the voices of Audrey, Dave, Willard Joe, Biyaals & Hans! To view the video click the link below. “What is lost with every passing generation? I wonder what will be left to pass on when we go? Can we let live, so we can live from the life she gives? it will be gone for good, forever. 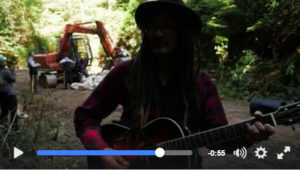 Join the fight at Elphinstone Logging Focus to save the Twist and Shout Forest.